AutoDWG DWGViewX, Faster than ever! 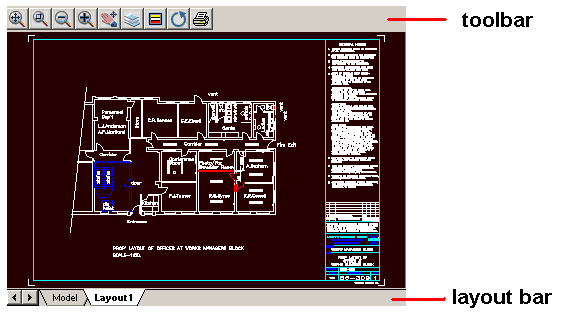 DWGViewX, an ActiveX control, view your DWG, DXF and DWF drawings in just one viewer. It is easy and you are managing all your CAD drawings with just one viewer. View DWG, DXF and DWF in versions from R2.5 to 2019. Relative path is supported: load drawings which are either on local disks or network websites. Zoom, pan, rotate drawings, turn on/off layers, change background and set font/XREF Path. Measure lines, calculate area and add personal markups. (Pro version only). This full featured DWGViewX ActiveX Control is a completely standalone utility, don't require any products from AutoDesk to use this converter. ActiveX is a software framework created by Microsoft which adapts its earlier Component Object Model (COM) and Object Linking and Embedding (OLE) technologies. You could embed this program to your own software to add the features of viewing and printing DWG, DXF and DWF files. If you get the distribution license, you also could distribute the software to any other users. The professional version of the control preserves all features of the standard version and also allows you to measure lines, calculate area, add personal markups, i.e. redline, text box markup, etc, and send your drawings with markups, or print with markups. The latest version of this DWGViewXPro 2017 has been released recently. You must run "regsvr32 DWGViewX.dll" to register the control first. The DWGViewX ActiveX Control is licensed as DEVELOPER LICENSE, SERVER LICENSE and SITE LICENSE. View DWG, DXF and DWF in versions from R2.5 to 2017. Load drawings which are either on local disks or network websites. Relative path is supported. Zoom, pan, rotate drawings, turn on/off layers, change background. Set font and XREF Path. Distribute the Derived Work to multiple users. A dwg viewer ActiveX control. View, zoom, pan, rotate, change background color, turn on/off layers, print with this littlie viewer. It is that easy and you are managing all your CAD drawings without AutoCAD. If you download the 32 bit version program, please double click the exe file to install the program. If you download the 64 bit version, please just unzip the installation files to the destination folder. Open the program folder and double click the file reg.bat to register the DWGViewX.dll/DWGViewX64.dll. If you run Win7 and the reg.bat file cannot work, please click start button>>All programs>>Accessories, then find the "Command Prompt" and right click it to choose "Run as Administrator" option to open the command prompt, then try to use the command regsvr32 to register the DWGViewX.dll/DWGViewX64.dll. Prior try out the active-x program with your own application, please try to give it a very first test with the example code enclosed with the free trial package, please make sure it will work as expected and then try out with other environments. Set drawing file name for the control, it supports http file and local file. Zoom window by specifying a rectangle area ( in pixel). This method has no parameters, call the method, and click the mouse in the control to specify the area to zoom. Pan the drawing by specify an offset. This method has no parameters, call the method, and click the mouse in the control to pan the drawing. Enable or disable context menu in the control. Add font support path for the drawing file.